Ring ring ring…Hello? DBH is calling to announce the release of the newest iPhone X, iPhone 8, and Galaxy S8 phone covers. I can carry my favorite piece of art with me wherever I go! Technology never stops advancing and neither does the DBH team. 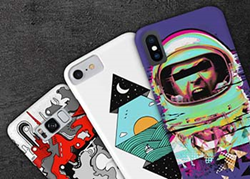 Design By Humans is excited to announce the release of the newest line of phone cases for the iPhone X, iPhone 8, and Galaxy S8. In the hustle and bustle of 2018, there is no living without a phone; still, that is no reason your phone needs to look like every other phone on the market! Find that perfect unique look for yourself; add some pop and style to your day with a DBH artist-designed phone case. The talented community of DBH artists never stops creating versatile and innovative art that embraces the changing world around them. Design By Humans recognizes that art is constantly shifting and transforming; it is a reflection of the dynamic world we live in. The phone case is the perfect way to transport artistry into our busy and technology-based lives in 2018. Art is not just a framed portrait in a gallery or a sculpture behind glass; art is meant to be touched, it is meant to be used, and it is meant to be a part of our everyday lives. Our Design By Humans’ team, like Customer Service Representative, Marie, and Web Developer, Tom, are thrilled with the idea of getting to experience their favorite designs as a phone case. Marie admits, “I can carry my favorite piece of art with me wherever I go!” and – in the same vein – Tom shares, “finally the Ghost of Disapproval can grace the case of my new iPhone X!” Join our team’s enthusiasm and enjoy your own favorite design on a newly launched iPhone X, iPhone 8, and Galaxy S8 cover. This is not a prank call; don’t miss the buzz of the new DBH phone cases. Technology never stops evolving and neither should you. DBH works to build an environment that respects collaboration, quality, integrity, and the entrepreneurial spirit. The DBH Collective is inspired by the comical as well as the abstract, the imagined and the concrete; and works to create innovative art that is an expression and a reflection of today’s society. We are gaming fiends, cat-enthusiasts, and pop culture fanatics. Most importantly, however, we are a passionate team of independent creators who buzz for the next buzz word, whistle as we work, and create designs that inspire the next generation of trendsetters from around the world. To become a part of the Design By Humans community and submit designs today, we encourage you to visit: https://www.designbyhumans.com/become-an-artist/ and learn more! Follow Design By Humans on Facebook at /DesignByHumans, on Instagram at DesignByHumans with #designbyhumans, and on Twitter @DesignByHumans.